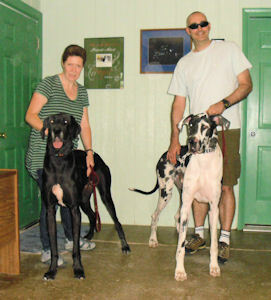 ADOPTED: I have found my forever home and I am lucky because Ghianti was my bestest friend and our new parents adopted us both!! They loved us both so much they could not decide!! Plus we have a brother named Hector and we both love him!!! Life is wonderful!!!! My new family!! Love and happiness filled the room! I was dumped on a rural country road in Brown County, I ran as fast as I could to try to catch my owner but they just kept going faster and faster. I was cold, hungry, and miserable. What did I do wrong??? Luckily I found a barn and took shelter in it and the next morning a nice woman found me and fed me then she called the Brown County Animal Shelter to come for me. The woman could not believe how emaciated I was!! Needless to say my owners never bothered to claim me. I mean really why would they after throwing me out to fend for myself!!! 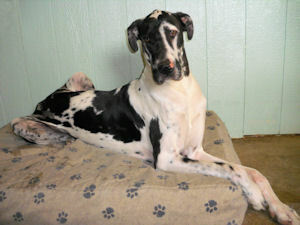 When my stray time was up Harlequin Haven Great Dane Rescue came for me and have given me a nice bed, food and toys!! I am getting many small meals each day till I gain weight. I want to thank the nice lady who found me, the Brown County Animal Shelter and of course the rescue for showing me that people really do care!! 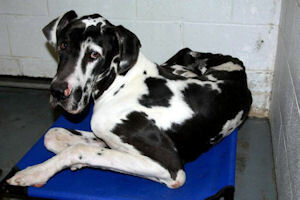 Update February 8: Just thought I would let you know that when I went into the shelter I weighed 108 pounds then 5 days later when I left the shelter I weighed 111 pounds I now weigh 116 pounds. So just letting you know that I am gaining my weight just doing it slowly! 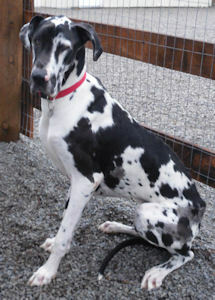 Update February 24: I now weigh 126 pounds and am enjoying playing with the other dogs and yes eating so life is good! Update March 3: I now weigh 132 pounds!!! Grandma said since I only need a couple more pounds that I can start looking for my forever home!! 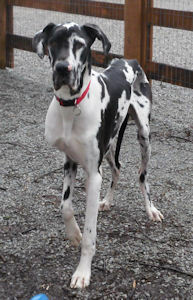 Update March 18: I just thought I would show you how handsome I am now!! Check out my new picture below! Update March 24: I guess I will never figure out humans! Everyone wanted to adopt me when I was skinny and sick but NOW that I am healthy no one wants me! Oh well I know I am loved and safe here at the rescue and I also have tons of brothers and sisters to play with so guess I will continue to wait till the right family shows up! Picture above compliments of the Brown County Animal Shelter.